No major shifts on another Tuesday dominated by THIS IS US. NBC: A Very Special THIS IS US was almost a full point higher than anything else on the networks, up 0.1 from last week to 2.5. It was preceded by the season finale of THE WALL, steady at 1.4, and CHICAGO FIRE, up 0.1 to 1.6. ABC: THE MIDDLE held at 1.5, and AMERICAN HOUSEWIFE was down 0.1 to 1.4. FRESH OFF THE BOAT (1.1) and THE REAL O’NEALS (0.9) were each up 0.1. 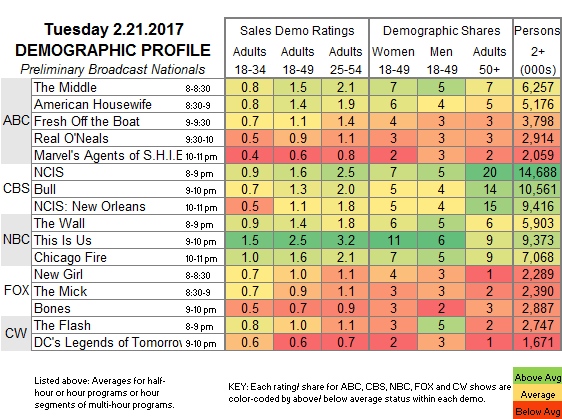 AGENTS OF SHIELD remained at 0.6. CBS: NCIS dropped 0.2 to 1.6. 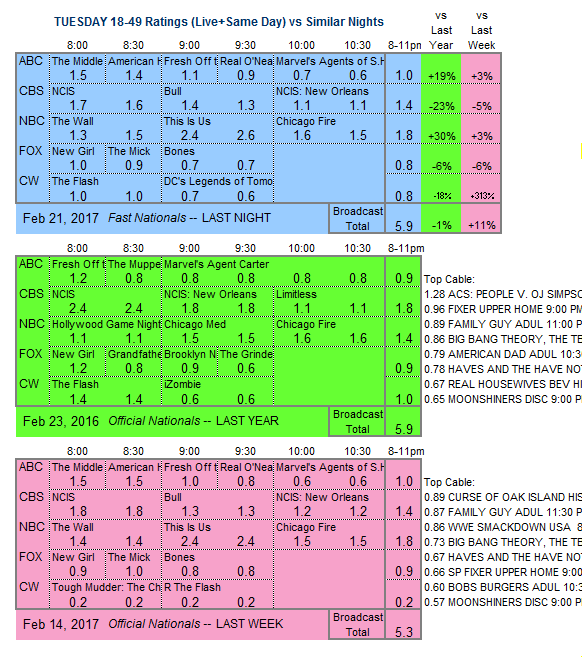 BULL was stable at 1.3, and NCIS: NEW ORLEANS lost 0.1 to 1.1. FOX: NEW GIRL gained 0.1 to 1.0, and the just-renewed THE MICK shed 0.1 to 0.9. BONES was down 0.1 to 0.7. CW: Returning from a week off, THE FLASH dropped 0.1 to 1.0, and LEGENDS OF TOMORROW was also down 0.1 to 0.6. TLC’s TOO CLOSE TO HOME and Bravo’s GIRLFRIENDS’ GUIDE TO DIVORCE end their seasons tonight, and TNT’s MAJOR CRIMES returns. CABLE RATINGS: Come back Thursday morning for detailed demographic ratings for top Tuesday cable programs, later than normal due to the Presidents Day holiday.